Leave it to Japan to explain correct weapon use in manga form. A new book, Drawing! Gun and Knife Combat Pose Style Graphics, claims to do just that. 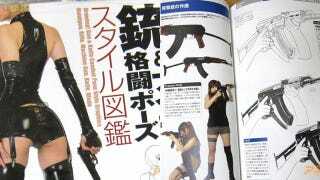 The book has over 800 color as well as black-and-white photos and manga style illustrations of various weapons and females showing how to hold said weapons. There are also explanations, shedding light on to each part of, say, an automatic handgun, plus 360 degree views of the weapon. This might've made a handy desk reference if, as website Akiba Blog pointed out, the weapon handling in the book were correct. In many instances, it isn't. Also, those outfits! Who shoots guns in latex?